These days, when electronic devices has become an inseparable thing of everyone’s life, we can’t imagine life without internet. Most of us have at least 2 internet supported devices e.g. laptop, smartphones, tablets etc. 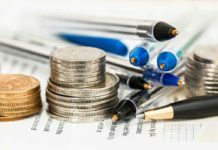 But having subscriptions on each device for internet separately makes it so tough for us to spend huge amount and a difficult task as well. In such situations, sharing internet connection by means of Wi-Fi hotspot apps makes enough sense, as most of the devices including your Smartphones and computers do have in-built feature of Wi-Fi. It look much fancy to have wire-free environment. Although, in smartphones like android devices, you can make your android device a Wi-Fi hotspot. Android phones has this in-built feature already. Using this feature, you can use internet on your laptop and any other device assuming you have Wi-Fi in the device in which you want to use internet. Wi-Fi hotspot apps allow you to connect multiple devices simultaneously with Windows PC to access internet. With these updated apps, you don’t need to assign IP Addresses manually or any other things. Just setup the app into your Windows PC, assign a password to secure your Wi-Fi from unauthorized access. You can control to whom you allow to connect. You can also find who is using your Wi-Fi connection by installing Who Is On My Wi-Fi. Connectify HotSpot is available in both versions i.e. Free and Paid. Like other tools, in free version you can fulfill your needs but if you want to get more then you need to buy license. A free version may irritate with on-screen ads. Connectify HotSpot tool turns your PC into a Wi-Fi transmitter allowing several devices to connect including mobile phones, game players like PS3, Xbox 360. Features like Dispatch, combining several internet connections into one, SwitchBoard makes it more awesome. This utility is integrated with better protection features like firewall to prevent the attack of threats on Internet. This utility also allows you to create a password to protect your Wi-Fi network from unauthorized connections from unwanted users. You can choose what type of security layer you want for your laptop. Virtual Wi-Fi Router is a simple, user-friendly and easy to use utility featured with tabs. It allows you to connect to multiple device at a time. All you need is to download and install the Virtual Wi-Fi Router for Windows, configure the settings by filling the SSID i.e. Networks name you want, password to protect from bad guys, choose the connection type from drop-down menu and click Start. You can see the upload and downloading speeds on the bottom of tool windows. 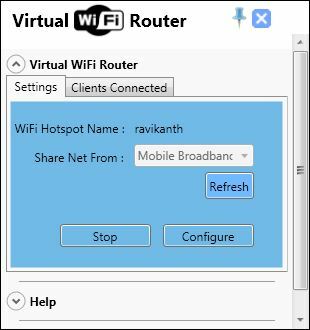 Virtual Wi-Fi Router is portable freeware for Windows NT, Vista, Server 2008, 7 and Windows 8 or 8.1 too. Using Virtual Wi-Fi Router, you can share your internet to Wi-Fi enabled devices, customize SSID (Wi-Fi Network’s name), encrypt WPA2 type layer (Advanced Encryption Standard (AES) algorithm), Add/Remove/Edit port forwarding. One things which may dissatisfied with Virtual Wi-Fi Router is that it keeps on pinning to notification area. Worst thing happens when you don’t have the option to hide those notifications. 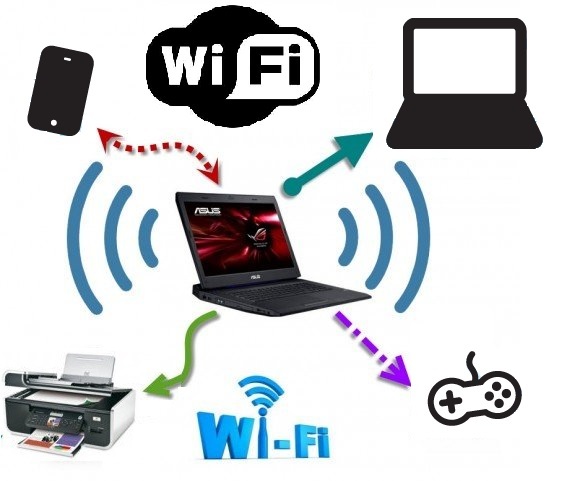 Your laptop can be a mobile Wi-Fi router. You can use it in the car, hotels, or anywhere you can connect to the Internet. Another great utility MyPublicWi-Fi is here. So easy to use in terms of features, user friendliness. MyPublicWi-Fi is available for both architectures i.e. x86 and x64 bit. This utility is available to download free of cost and is compatible for all editions of windows including Windows XP/7/8/8.1. This app will simply turn your Windows PC into a Wi-Fi Hotspot so you can connect other Wi-Fi devices to your PC and share same internet connection. With two WPA2-based encryption modes, MyPublicWi-Fi tool helps prevent Virus, Trojan, Spyware, Worm and Rootkits etc. from destroying your computer through Internet. You can set passwords for Wi-Fi Networks you have created. This program displays the list of devices connected to your computer so enabling you to control them to access your internet connection. This tool provides you the list of websites accessed through your Wi-Fi network. If you think that someone is using some “undesired” website that you don’t want to allow on your Wi-Fi, you can disallow them. Furthermore, this helps on the places like offices, schools and colleges where you don’t want to allow your employees/students to access social networking/messaging apps to use. This tools also works as a repeater (In digital communication systems, a repeater is a device which receives a weak signal on an electromagnetic transmission medium and regenerates its strength.) Hence, you can use this tool to boost the strength of your signal in your home network. 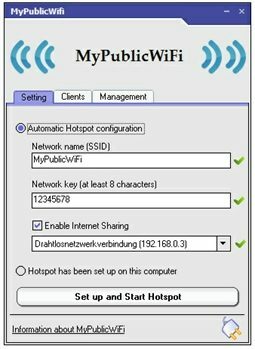 mHotSpot lets you create Wi-Fi HotSpot for your computer. It’s quite easy to use and user interface adds more beauty to it. 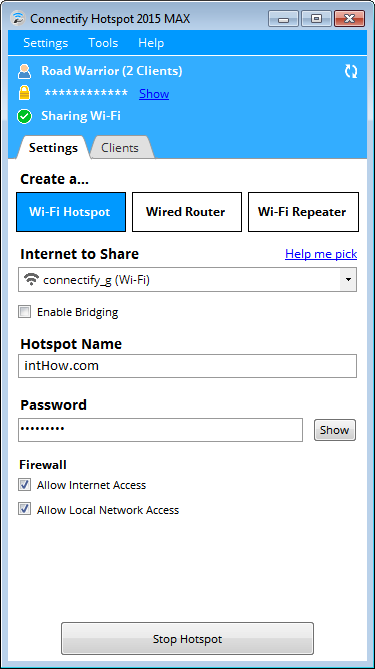 Using this software, you can limit the number of client devices to connect to your W-Fi HotSpot Computer. It is free to download using which you can create a hotspot by choosing a name for hotspot, password, source of internet and maximum number of client devices to computer. Using this, you can secure devices with security layers. You can share single internet connection (LAN, Ethernet, Data-Card, 3G/4G) for multiple devices like laptops, smartphones, ipads, tablets. Play games using mHotspot, no router or external hardware is required apart from your existing one. mHotSpot can support upto 10 devices simultaneously. You can limit the number of devices to connect to your HotSpot by putting restrictions on them. 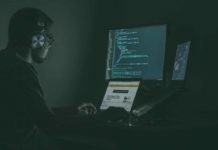 You can know what devices are connected to your computer and what bandwidth are they using. Unlike other HotSpot tools, it is much smaller in size and easy to download for the users who has smaller connectivity of internet. Indeed, it is a must have utility for each pc. Last but least. MaryFi is one of the best windows software. 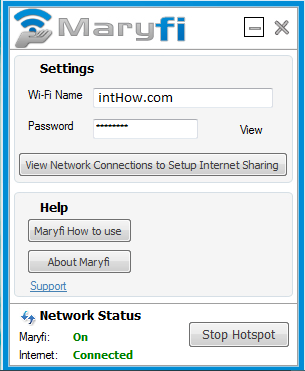 Using MaryFi tool, you can share your internet connection of both types whether it is wireless or cabled. MaryFi is available for the latest edition of windows. This application is supported for Wi-Fi enabled devices like smartphones, mobile phones, tablets, gaming devices and music players etc. Using this tool, you can connect to internet anywhere. The offline mode of the software allows you to share files like images, videos, documents etc. between two devices. Using WPA-2 based security, you can protect your HotSpot security from unauthorized access. Despite using it as a Wi-Fi tool, it can also be used to repeat the weak signals. You can boost the strength of signals using this tool. This tool receives the weak signals, re-propagate them and send them to next device. The best part of it, being freeware tool, it will not put ads on your computer to make your task difficult. The process for all the tools described above is almost the same. Download the tool, setup it, choose network name, provide password and finally choose type of Wi-Fi connection. Varying thing in all is that one may have more features than the previous one. So, what are the new and better tools you use for yourself. Let me know. Feel free to say your words. 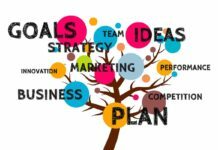 Is It A Good Idea To Outsource Your Sales?